Diana is the author of Creating a Life Together: Practical Tools to Grow Ecovillages and Intentional Communities and Finding Community: How to Join an Ecovillage or Intentional Community (New Society Publishers, 2003, 2005). She teaches Sociocracy to intentional communities — including ecovillages and cohousing communities — in North America and internationally. She also leads workshops on starting all varieties of intentional communities, how existing communities can succeed and thrive, and on governance and decision-making. 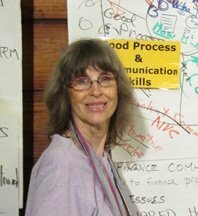 As a representative to GENNA, Global Ecovillage Network North America, Diana Leafe Christian writes about North American ecovillages for the GEN (Global Ecovillage Network) Newsletter. She was editor of Communities magazine for 14 years, now publishes Ecovillages newsletter. Diana does workshops and training for intentional communities internationally including the United States, Canada, South America, and Europe. She is a partner in The Sociocracy Consulting Group (TSCG). She is a member of Earthaven Ecovillage in North Carolina.